I love how many ways you incorporated pretzels into these! I don't think I've ever tried using pretzels in a dessert but I'll have to start by making these, they look amazing! Joe - how do you think it would be if you cut the butter by a T or two? I have missed your posts and am wishing you well! I hope they find answers quickly. Being ill is no fun. I have missed your posts ---- I miss trying new recipes. We lost Velcro on February 7 of this year. We found out she had stomach cancer in early December. She lasted 2 months and we will charish each day she was with us. We are looking for a new rescue. Printed this and even though you mention an 8 inch pan as an alternate, I think I'll use this as an excuse to buy one of those long rectangular tart pans. I've always wanted one! Foodie - Well, honestly, the whole point of shortbread is the butter! I wouldn't skimp on it, sorry. Carole - So sorry to hear about Velcro! Let us know how the rescue search goes! I just wanted to check and see if the recipe calls for 1/4 cup sugar or 1/2 cup sugar. 1/4 cup is listed twice so I just wasn't sure. Thanks! Hoping to make this next weekend. Michelle - Half cup total, but I meant to have one of them say packed brown sugar. Thanks for catching that! Great, thanks Joe. Looking forward to making this! Great to see this post. Hope the new treatment does the trick for you... it has got to be real tough! hang in there. The bars sound delicious. 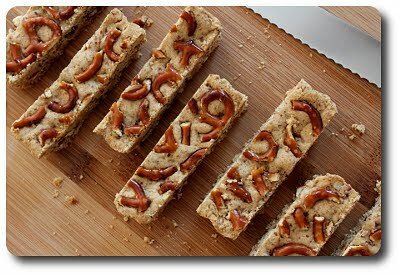 I'm so glad I found your blog, if for these shortbread bars alone! I'm a sucker for salty-sweet desserts! I am definitely going to give these a try!